Magnetic Roll Separators from Star Trace are the most trusted magnetic separation equipment followed by umpteen numbers of industries to separate ferrous from non ferrous substances. The Magnetic Roll Separator uses powerful rare earth magnets that perfectly segregate feeds; this is made possible by the properties and special series of magnet used. Substances with low magnetic properties are also effectively separated and so there are no chances of missing out even the least magnetically active substance. The Magnetic Roll Separator uses rare earth magnets for separation which are an alloy of rare elements. The separators are manufactured in varying magnetic intensities to suite the requirements of various industrial applications. Customized models with variations in magnetic intensity, count of magnetic rolls, roller width etc. can be manufactured. 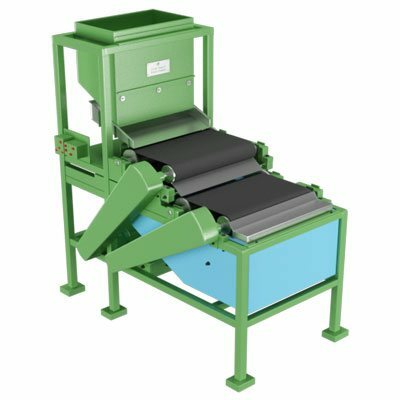 Single stage Magnetic Roll Separator is also available but as the roll count increases separation reaches higher standards. Star Trace has been into the manufacturing of Magnetic Roll Separator for more than two decades and this has helped in unveiling perfectly working equipments. STAR TRACE is one of the Asia's leading manufacturing Company in Permanent Magnetic Equipments and Vibrating Equipments in Dry/Wet Separation of minerals and metals. The Dry Permanent Magnetic Roll Separators systems are unique in nature and we are supplying similar equipment throughout the world and more than 1000 Industries are having our Equipments. In our past 25 years of experience, we can separate from Coal to Gold in all minerals and metals from anywhere in the world, depending upon on their mining location, we are able to provide you complete solutions to upgrade your metals, minerals and your processes. These Magnetic Roll Separators are highly effective of separating para magnetic particles and weakly para magnetic particles separately. These Rare Earth Magnetic Separators or Magnetic Roll Separators are made up of very high power specially developed Nickel, Iron Boron (Nd-Fe-B) with highest magnetic power available in the series to enable us to achieve very high gauss value compared to other similar products. Right now, we have developed latest Magnetic Roll Separators with a diameter of 150mm which gives higher magnetic force and more contact area than the normal 100mm diameter magnetic rollers. These Magnetic Rollers are specially configured with configurations of suitable material sizes and its magnetic properties. The Magnetic Roll Separators have been passing through the belt which the material is running, is made of different materials with different thickness to suit effective beneficiation of separating minerals and metals. These effective magnetic roll separators separators can be achieved with different thickness of belt ranging from 0.25mm to 2mm and some of the belt material which we have been using are having a non stick property and they are highly resistant to abrasiveness. Some of the belt material of the Magnetic Roll Separator are coated with Nylon for its non stick property. These belts are basically made up of Kevlar, which is a Bullet Proof material and highest strength of its kind. These STAR TRACE Magnetic Roll Separators are having several passes to make sure of highest purity can be obtained by which several process repeatedly without much material handling. These Magnetic Roll Separators are primarily used in replacement of old technology of induced magnetic roll separators. The Magnetic Roll Separator has two rolls of which one does not contain magnets where as the other has magnet embedded in the roll. The two rolls are wrapped by conveyors belts over which the feeds travel for separation. Upon crossing over the magnetic roll, all the magnetic substances stick to it till they are relieved from the magnetic field. Non magnetic substances fall freely from the Magnetic Roll Separator where as those reacting to the magnetic field fall further away. If multiple rolls are installed separation takes place at each level and a purely magnetic output is derived. 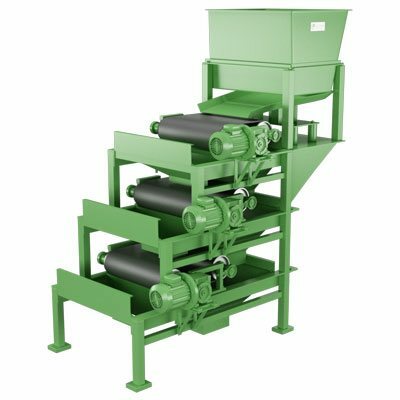 The material to be processed is conveyed to the belt by vibrating feeder at a required rate. Feeding rate can be controlled by adjusting the vibration on feeder. A Roll separators blade has been set in order to be able to collect separated products in different places and to adjust the product properties in a desired manner. By making adjustments in pulley and belt the roller speed can be changed. Positioning of the Splitter is by visual observation. Star Trace Magnetic Roll Separator has been designed to render exceptional magnetic separation with high field intensity magnets that work for several years without reduction in strength. The Nd-Fe-B combination of rare earth magnet is known for its exceptional performance in magnetic separation. The dimension is in accordance to standards and can be readily put o use in an existing set up. However if tailor made sizes are to be designed we have an experienced team to handle you requirements. Having served clients for more than two decades we are well versed in customizing our products and have been very much appreciated by our clients. The rare earth magnets used in the Magnetic Roll separator is of high intensity as it is of the combination of Nickel-Iron-Boron. The magnetic intensity displayed by it is incomparable to products of similar range. Listed below are the applications of Magnetic Roll separator. Removing Ferro silicates present in magnetite, Lime stone and several other minerals. Rare Earth Magnetic Roll Separators are made up of very high power specially developed Nickel, Iron Boron (Nd-Fe-B) with highest magnetic power available in the series to enable us to achieve very high gauss value compared to other similar products. Maintenance is simple and easy. Separation in Single and multiple stage. The physical shape, moisture content and flow characteristics play an important role in reaching the required output rate. Output is increased by bulk density and higher values. 3mm is the satisfactory particle size for treatment in the magnetic roll separator. For substances measuring around 50mm drum separators or electromagnetic multi channel pulley can be used. Flow quality depends on particle shape, size, surface finish, moisture level etc. Star Trace is one of the reputed organizations that supplies impressive magnetic separation equipment, one among them is the Magnetic Roll Separator. The Magnetic Roll Separators which is a high intensity magnet embedded separator serves as a highly efficient method to segregate ferrous from nonferrous which is made possible by implementing latest technology. High standards of purity are achieved which stands as the core reason for the exceptional sales of Magnetic Roll Separators. 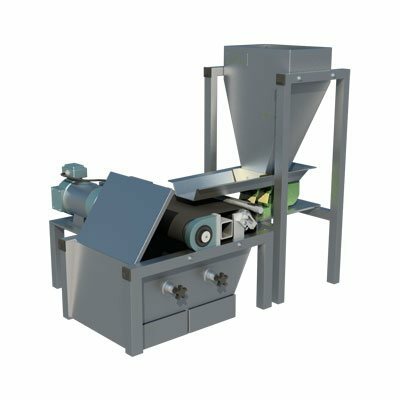 The new generation Rare Earth Magnetic Roll Separator designed by Star Trace incorporates the latest technology adopted in manufacturing roll separators. The high gradient, high intensity, rare earth permanent magnet produces exceptionally pure output matching the required standards. 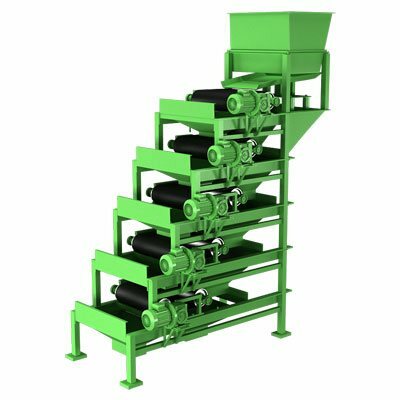 The roll magnet is supplies with feeds that need separation from ferrous particles through a conveyor which moves over the roll magnet. All magnetic substances are attracted by roll magnet whereas the non-irony material fall freely from the conveyor of Magnetic Roll Separator. To counter check the free flowing substances for traces of iron, they fall on the second roll separator. If any ferrous particles were missed out they are captured in this magnet of Magnetic Roll Separators. So one can be sure of minimum loss of ferrous particles. Star Trace, one of the well-known names for technical excellence has been in the business of magnets for over 25 years supplying quality equipment to clients globally. The Permanent Roll Magnetic Separator is one of a kind equipment to separate ferrous from nonferrous across thousands of industries. Fitted with strong rare earth neodymium permanent magnet the Magnetic Roll Separators is capable of detecting even the smallest ferrous particle thus making the process of separation perfect. Working – A short conveyor wraps the roll magnet and starts moving as the operation begins, feeds deployed on the conveyor reach the roll separator. The particles stuck to the conveyor are magnetic in nature whereas the free falling ones are nonferrous. If further refining is required a double roll magnetic separator can be used. The ease of use of the roll magnetic separator or Magnetic Roll Separators allows anyone to handle it with comfort with simple instructions. Take advantage of the well refined production sequence we follow to derive quality products. A combination of quality, effectiveness and cost effectiveness is rare and we offer it for our esteemed customers. 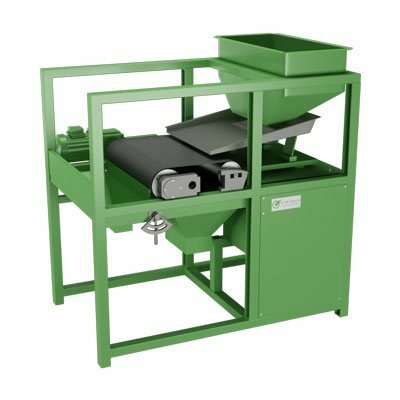 Roll Magnetic Separator is of many types one that is employed for handling dry input is the magnetic roll separator. Star Trace has designed an indigenous Dry Type Magnetic Separator capable of effectually handling volumes without down time. The rare earth magnet placed in the roll exhibits strong magnetic field which allows it to trap all magnetic particles irrespective of size. The construction of Dry Type Magnetic Roll Separator is uncomplicated with a hopper to introduce the feed, a conveyer belt covering the roll magnet brings the feed into the magnetic field and magnetic particles are attracted to the conveyer and travel with it until released of magnetic pull. Nonmagnetic substances fall freely below or to the next roller for further filtration. Separated particles are collected in discrete chambers.